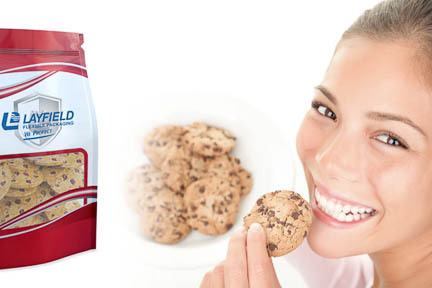 Layfield provides both bag in box liners and stand up pouches for cookies, crackers and dry bakery products. The flat-bottom bag or box pouch with reclosable zipper is becoming increasingly popular due it’s convenient packaging and high quality printing capabilities. Layfield packaging experts will work directly with you to recommend the optimal barrier properties and film thickness to ensure optimum product quality and maximize shelf life. Flexible packaging provides good product visibility with important quality preservation by preventing humidity absorption and good barrier to oxygen and light through innovative film barriers and structures. Speak to one of our packaging consultants or advisors today.